Whenever I go out of town, especially to a small town or vacation spot, I like to visit the local grocery stores to see what kind of interesting items they have that aren't on the shelves of my grocer at home. At the beach, this includes going to the discount stores such as Family Dollar and Dollar General and seeing what kind of stuff they have. At times, I wonder how long some of the packages have been on their shelves...and where they get this stuff. Take these items, for example. 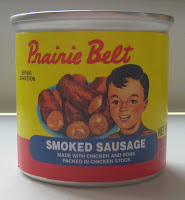 What caught my attention about Prairie Belt Smoked Sausages is this 1950s-looking kid on the label. How exactly is this boy linked to the sausages? Is he Prairie Belt's mascot? Does his excitement for chicken and pork packed in chicken stock defy explanation? He reminds me of Happy Boy. Family Pantry is a brand carried by Family Dollar, and many of their packages try to look somewhat like the more popular name brands. 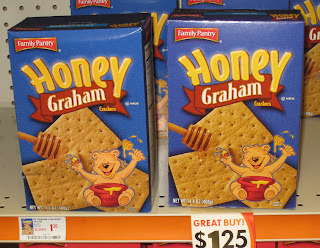 On this box of Honey Grahams, their "unique" touch is the happy bear on the front. Should we make something of the fact that he's playing with something thick, sticky, and dripping between his legs...and that he's got such an elated look on his face? I always like to see how smaller manufacturers brand their products. Take Bud's Best, for example. What apparently distinguishes their brand of cookies from others is the image of Bud on the front (or at least an image I assume to be Bud). Look at that happy face and his open, welcoming arms. I'm sure with a mascot like this, the chocolate chips would just have to be real. Bud wouldn't let us down, would he? And you know you'll have unmitigated fun with this product. Just look at the "oo" in "Boogie." 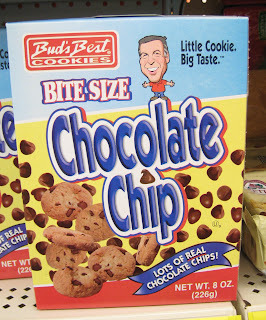 How do you know that the dude on the chocolate chip cookies box is named Bob? Does it say Bob somewhere and I just missed it? I would assume his name was Bud. 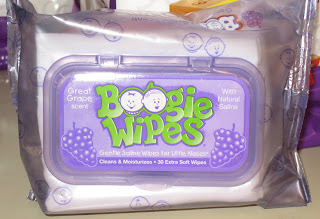 Also...are Boogie Wipes meant to be for the nose?? What's with the grape scent?! Even tissues or baby wipes don't come in fruity flavored scents. Usually it's something like baby powder or flowers. Right, Pink! Thanks for catching that. It's "Bud," by my fingers typed "Bob." 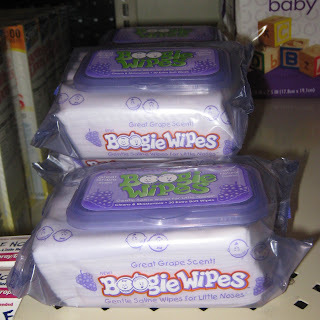 Yeah, apparently Boogie Wipes are scented (or unscented) saline wipes for kids' noses (and, I suppose, anything else that can benefit from a simple moist wipe). I've seen them in stores, but haven't indulged; our almost-three-year-old does just fine with traditional tissues and--yes--handkerchiefs.